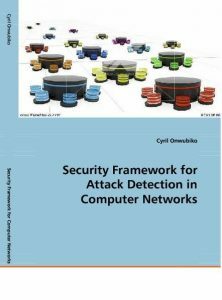 C. Onwubiko, (2008), “Security Framework for Attack Detection in Computer Networks“, ISBN: 36390893490, December 2008. 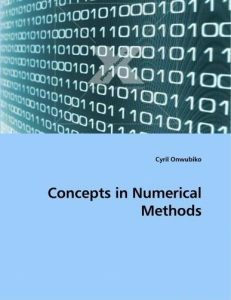 C. Onwubiko, (2009), “Concepts in Numerical Methods“, ISBN-13: 978-3-639-18609-3, August 2009. C. Onwubiko & T. J. Owens, (2011) “Situational Awareness in Computer Network Defense: Principles, Methods & Applications“, 10.4018/978-1-46660-104-8, ISBN13: 9781466601048, IGI Global, USA, 2011. C. Onwubiko (2015) “Cyber Science 2015: International Conference on Cyber Situational Awareness, Data Analytics and Assessment (CyberSA)“, ISBN13: 978-0993233807, ISBN-10: 0993233805, C-MRiC.ORG, London, UK, 2015. 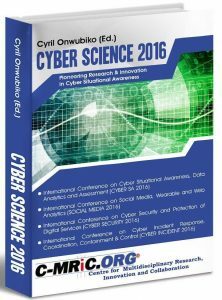 C. Onwubiko (2015) “Cyber Science 2016“, ISBN13: 978-0993233814, ISBN-10: 0993233813, C-MRiC.ORG, London, UK, 2016. C. Onwubiko, (2010) “Security Issues to Cloud Computing “, in Cloud Computing: Principles, Systems & Applications, (Eds) Nick Antonopoulos and Lee Gilam, Springer-Verlag, August, 2010. C. Onwubiko, (2011), “Challenges to Managing Privacy Impact Assessment of Personal Identifiable Data“, in Information Assurance and Security Technologies for Risk Assessment and Threat Management: Advances, (Eds) Te-Shun Chou, 2011. C. Onwubiko, (2011), “Designing Information Systems and Network Components for Situational Awareness“, in Situational Awareness in Computer Network Defense: Principles, Methods and Applications, (Eds) Cyril Onwubiko and Thomas Owens, IGI-Global, 2011. 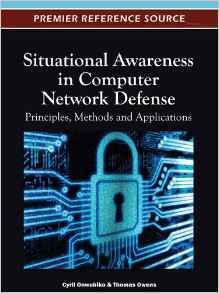 C. Onwubiko & T. J. Owens, (2011), “Review of Situational Awareness for Computer Network Defense“, in Situational Awareness in Computer Network Defense: Principles, Methods and Applications, (Eds) Cyril Onwubiko and Thomas Owens, IGI-Global, 2011. C. Onwubiko, (2011), “Modelling Situation Awareness Information and System Requirements for the Mission using Goal-Oriented Task Analysis Approach“, in Situational Awareness in Computer Network Defense: Principles, Methods and Applications, (Eds) Cyril Onwubiko and Thomas Owens, IGI-Global, 2011. C. Onwubiko, (2015), “Health IT: A Framework for Managing Privacy Impact Assessment of Personally Identifiable Data“, in Handbook of Research on Emerging Developments in Data Privacy, (Ed) Manish Gupta, IGI-Global, 2015. 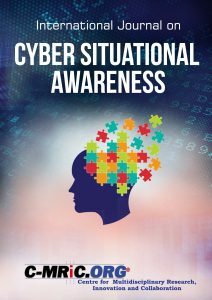 C. Onwubiko (2016): “Understanding Cyber Situation Awareness“, International Journal on Cyber Situational Awareness (IJCSA), ISSN: 2057-2182, DOI: 10.2216/IJCSA. 2016. 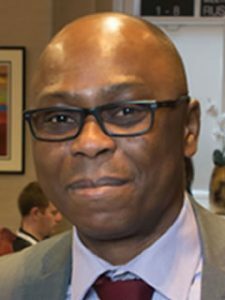 C. Onwubiko (2016): “Exploring Web Analytics to enhance Cyber Situational Awareness for the Protection of Online Web Services“, Proceedings of the IEEE International Conference on Cyber Security and Protection of Digital Services (Cyber Security 2016), joint and co-located with Cyber Science 2016 conferences, London, UK, June 13-14, 2016. 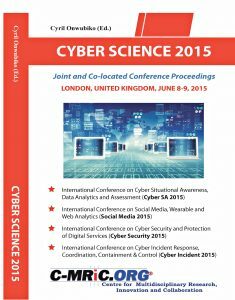 C. Onwubiko (2015): “Cyber Security Operations Centre: Security Monitoring for protecting Business and supporting Cyber Defense Strategy“, Proceedings of the IEEE International Conference on Cyber Situational Awareness, Data Analytics and Assessment (CyberSA 2015), joint and co-located with Cyber Science 2015 conferences, London, UK, June 8-9, 2015. C. Onwubiko (2006): “Towards a Backup Cipher for the Advanced Encryption Standard (AES)” ; Open Source Publication on Communication Networks and Electronic Security – Journal for ICT Security Synergy in Advanced and Developing Economies ISSN 1746-8558 Volume 1, 2006. C Onwubiko (2007): “Managing Security for SMEs”; (Invited Guest Lecture), Dependable and Network Security Week, Networking and Communications Research Group, Faculty of Computing, Information Systems and Mathematics (CISM), Kingston University, Feb. 1 2007, in London, UK. C. Onwubiko (2001): “Fault-based Cryptanalysis – a review of Data Encryption Standard (DES)”; (Presentation), University of East London (UEL), Duncan House, Stratford, London, E15 2JB, UK, Oct. 2001. C. Onwubiko (2001): “Building Authentication Server”; (Presentation), University of East London, Duncan House, Stratford, London, E15 2JB, UK, June 2001. C. Onwubiko (2007): “A Framework for Detecting Enterprise-Wide Security Attacks in Computer Networks” (PhD Thesis, 2007), Networking and Communications Research Group, Faculty of Computing, Information Systems & Mathematics, Kingston University, London, UK, November, 2007. C. Onwubiko (2002): “Critical Analysis of Twofish Cipher against the Advanced Encryption Standard (AES)” (MSc Dissertation, 2002), Internet Engineering, University of East London, Duncan House, Stratford, London, E15 2JB, UK, October 2002. C. Onwubiko (1996): “Implementing an Automated Banking Application” (B.Sc. Dissertation, 1996), Computer Science & Mathematics, Federal University of Technology, Owerri (FUTO), October 1996.